Superb gift for couples and newlyweds. Popular for wedding or anniversary gifts and housewarming gifts. These 75 x125cm bath sized towels are soft Cotton. 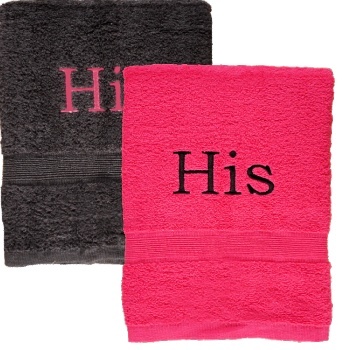 Personalised with your choice of embroidered text on each towel. We used alternating thread colours and the Print font for our example. You select the letter style and thread colours you want! Please fill in each of the text boxes with the wording you would like embroidered. Personalised Towels are custom made to order and usually dispatched in 2 working days.